One of the first things that I ever baked when I was a little girl, other than cut-out sugar cookies for Christmas, was homemade bread. Baking homemade bread will always be one of my favorite things to bake. So when zucchini season comes around I’m the first one on the phone with my friends who grow zucchini in their gardens. Maybe someday, when we own a house, I’ll grow my own but until then, I make sure to bribe my zucchini growing friends with lots of delicious treats in exchange for some zucchini’s to make this amazing zucchini bread. 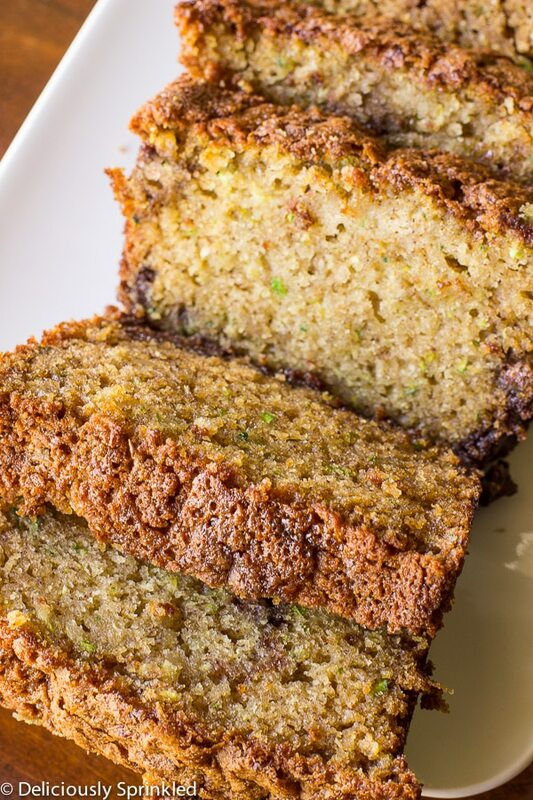 This zucchini bread recipe is the best zucchini bread recipe EVER. I promise you that. This bread is so moist and yummy with a delicious hint of cinnamon. 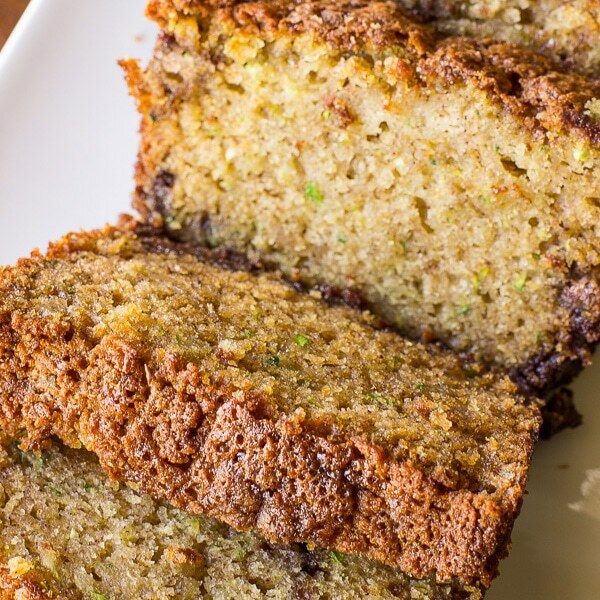 Not to mention, this zucchini bread is so simple to make. Pretty much just dump everything into a large bowl, mix and bake. And it makes the house smell amazing while it bakes. ✓ DO NOT OVER MIX: It’s super easy to overmix this zucchini bread batter because the batter is on the “thinner side”. So it’s super important when adding the flour mixture to the wet ingredients to only mix until just combined. Meaning you will still see some flour in your mixing bowl. Overmixing leads to dense, dry, yucky bread! 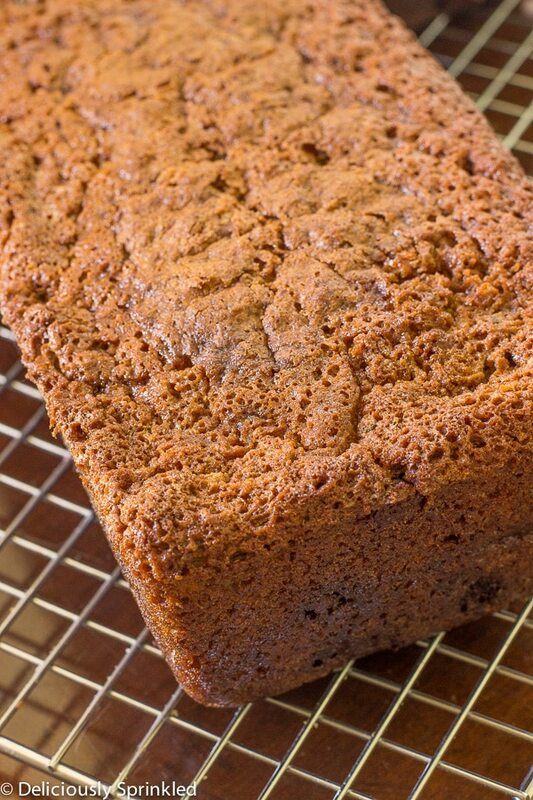 ✓ CHOCOLATE CHIPS OR WALNUTS: I didn’t add anything to this zucchini bread recipe but you could add 1 cup of mini chocolate chips (regular sized chocolate chips are too heavy for this batter, and will sink to the bottom when baked) or chopped walnuts. PRE-STEP: Preheat oven to 350F degrees. Spray 2 9 inch loaf pans with non-stick cooking spray. Set aside. STEP 1: In a large bowl, mix together sugar, vegetable oil, eggs, and vanilla extract. Beat until well blended. STEP 2: Add zucchini, applesauce and orange juice; stir well. STEP 3: In a medium bowl, whisk together flour, baking soda, baking powder, salt, nutmeg and cinnamon. STEP 4: Add flour mixture to zucchini mixture and stir until combined. STEP 5: Pour the batter into prepared loaf pans. Bake for 1 hour or until a toothpick inserted into center comes out clean. STEP 6: Let cool in pans for 10 minutes. Remove from pans and let cool completely on wire rack. I made this with sprouted white wheat flour and stevia for a healthier version. I think I might use agave nectar next time as the stevia was a bit over powering. Hi, this receipt sounds delicious! But, how many zucchinis do I need to get 2 cups grated zucchini ? I adore Zucchini Bread and this looks like the perfect, comforting loaf of bread that I could dive into! I love zucchini bread because it doesn`t taste like zucchini. I would eat this whole loaf just to say I had my share of zucchini. This looks so tasty. can`t wait to give it a try.